We help leaders succeed in their first days on the job and rapidly accelerate the value they bring to a new role. An executive’s transition period can offer unparalleled opportunity to lay the foundation for success. When it’s navigated correctly, it's a time for the leader to build momentum, develop credibility, win trust, and engage key stakeholders. When they come out of the gates with early wins, the leader sets the course for their ability to drive the business strategy in the long-term. The smartest organizations know that a proactive approach is required for managing transitions. After all, leaders are presented with new and daunting challenges. When a rising star moves from leading a group to leading an enterprise, or leading a function to taking on P&L responsibility, they encounter new demands. They must quickly adapt to new circumstances and apply new skills. Often times, they jump in blindly, discovering the nuances of the role along the way as they deal with market pressures, legacy crises, and strategic decisions. This reactive, “pick up the pieces” approach may be the reason a high percentage of leaders fail within the first few months on the job. Derailment can be astronomically costly to the organization – in terms of resources, reputation, and on the bottom line. Executive Transition and Integration Coaching is essential for helping leaders successfully make the shift and accelerate the value they bring to a new role. A trusted advisor in the critical early days can help the leader get off to a faster start, and guide them to stay focused on priorities crucial for both short-term and long-term success. In transition coaching, we apply a holistic approach to evaluating the leader’s readiness and identifying potential barriers to success. Guided by our proprietary research-based model of executive influence, we measure the qualities that will enable the leader to engage, inspire, align, and move people to act. The leader is able to appreciate early on how perceptions of these qualities may differ from his/her intentions. They partner with the coach to quickly act in addressing development areas and deploying strategies for winning trust and building strong followership. 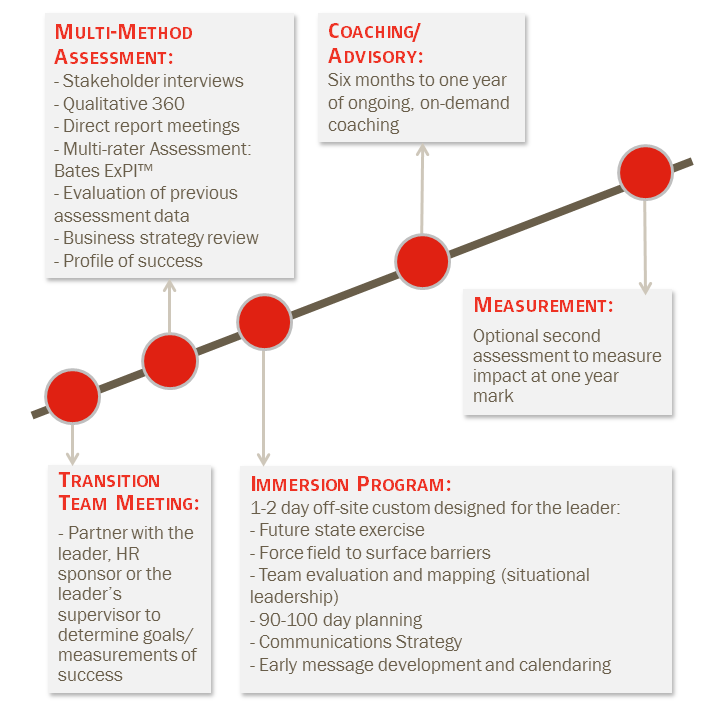 Throughout the process, we partner with the leader, their broader transition team, and their HR partners to align the work with the overall organizational strategy and goals.